"Originally trained as a computer scientist, Myron Krueger, under the influence of John Cage's experiments in indeterminacy and audience participation, pioneered human-computer interaction in the context of physical environments. Beginning in 1969, he collaborated with artist and engineer colleagues to create artworks that responded to the movement and gesture of the viewer through an elaborate system of sensing floors, graphic tables, and video cameras. At the heart of Krueger's contribution to interactive computer art was the notion of the artist as a "composer" of intelligent, real-time computer-mediated spaces, or "responsive environments," as he called them. 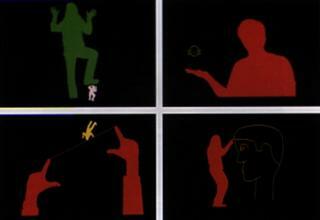 Krueger "composed" environments, such as Videoplace from 1970, in which the computer responded to the gestures of the audience by interpreting, and even anticipating, their actions. Audience members could "touch" each other's video-generated silhouettes, as well as manipulate the odd, playful assortment of graphical objects and animated organisms that appeared on the screen, imbued with the presence of artificial life." "Two people in different rooms, each containing a projection screen and a video camera, were able to communicate through their projected images in a «shared space» on the screen. No computer was involved in the first Environment in 1975. In order to realize his ideas of an «artificial reality» he [Krueger] started to develop his own computer system in the years up to 1984, mastering the technical problems of image recognition, image analysis and response in real time. This system meant that he could now combine live video images of visitors with graphic images, using various programs to modify them. When «Videoplace» is shown today, visitors can interact with 25 different programs or interaction patterns. A switch from one program to another usually takes place when a new person steps in front of the camera. But the «Videoplace» team has still not achieved its ultimate aim of developing a program capable of learning independently." "Since 1969, I have been trying to raise interactivity to the level of an art form as opposed to making art work that happened to be interactive. From the beginning, I reasoned that interactivity would be limited by what the computer knew about the participant's behavior, and I developed specialized computers for perceiving the human body. I have also incorporated the image of the person's body into the computer graphic images. In general, I have stuck to the premise that everything that happens should be a direct response to the participant's actions. However, within that discipline a number of different kinds of pieces can be developed. One family of interactions I think of as two- or three-dimensional "mini-media," which visitors can use to create their own dynamic artistic expressions. Others involve two or more participants in different locations who interact with each other in the same virtual space either as a spontaneous interaction or as a live performance. Although 30 years have passed, interactivity is still beginning. Many of the preliminary ideas I started out with are still unrealized, and more advanced concepts are waiting to be invented. "